When walking solo I tend to go by train, either on the West Highland Line or the Inverness Line. In the east this isn't too bad, as there is a very early service from Glasgow Queen Street, and later trains coming back, giving you a good length of time in between to walk. The West Highland Line has an even earlier train, the 0530hrs from Glasgow. Not living in Glasgow I can't get that train, as the first train doesn't leave Airdrie until 0530hrs. 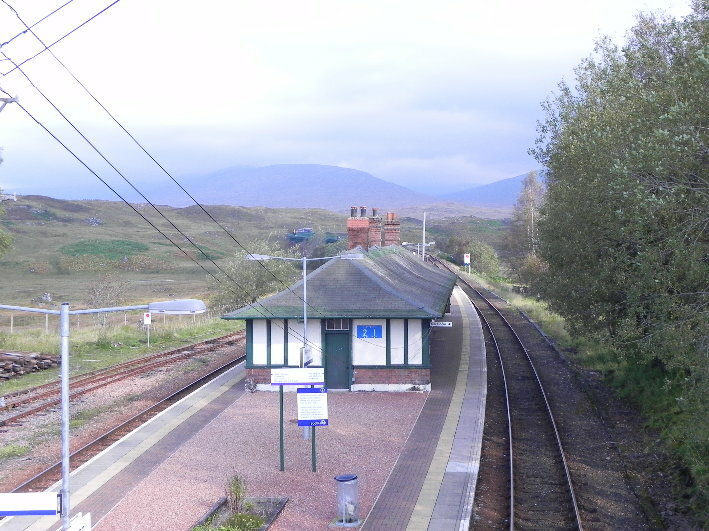 Likewise returning at night I have to be on the train which leaves Fort William at 1737hrs, as the sleeper, while giving a longer walking day, doesn't get in to Glasgow until after midnight, long after the last Airdrie bound service. This means there is a window of walking 'between trains' which decreases the farther north you go. 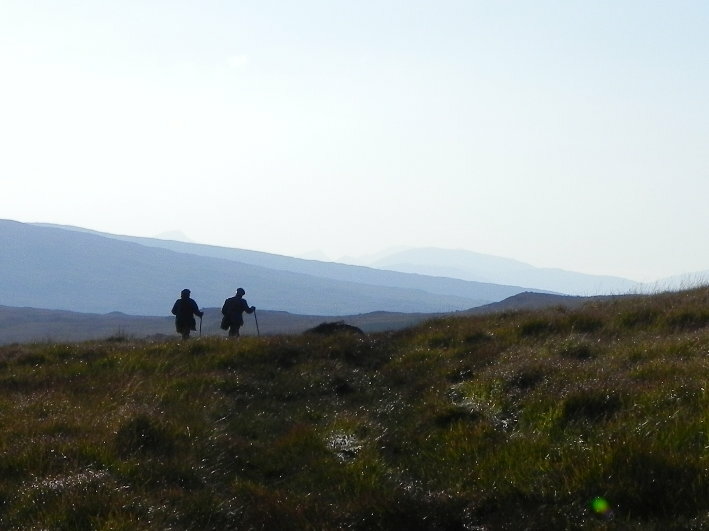 You have around nine hours walking for example at Crianlarich, dropping to just seven hours at Corrour. There are a few hills which are just about manageable at Tulloch, but to be honest that is creeping in to overnighting territory. 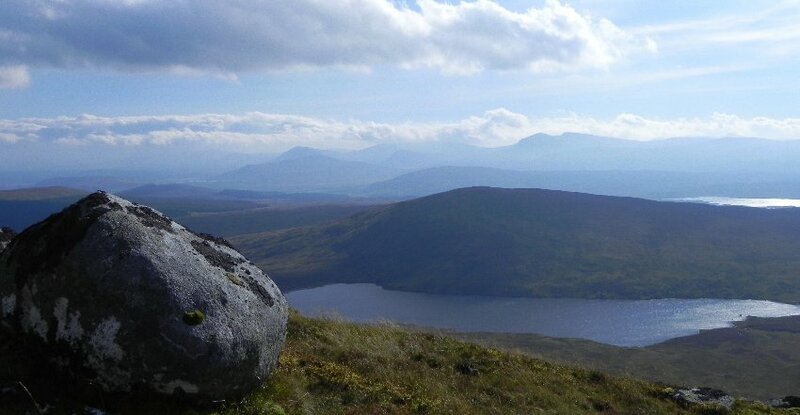 A few years ago I walked from Dalwhinnie to Rannoch, staying overnight at the reputedly haunted Ben Alder Bothy. 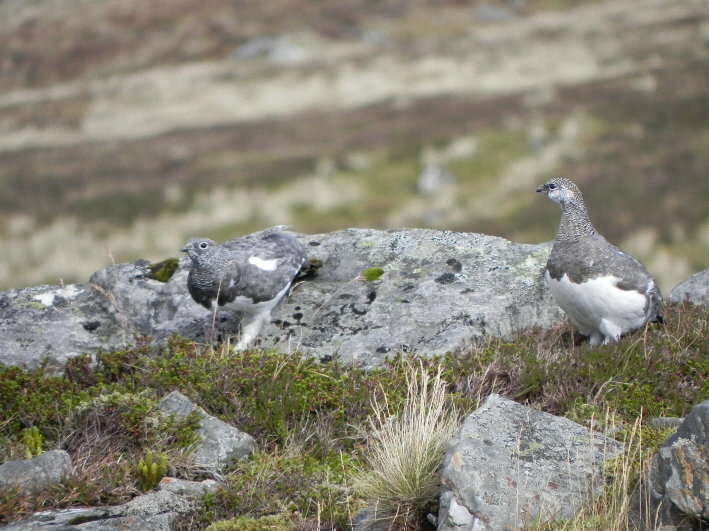 After being drenched on the way over the pass, I was welcomed by two anglers from Glasgow who had carried in the mother of all 'cairry-oots' and a mountain of food. After a few beers I wasn't bothered one iota about so called ghosts and had a cracking night there. The next morning I had to get to Rannoch. I had been looking at a map on the bothy wall, and had now noticed a short cut over the hills by Sron Smeur. However I had brought printed off A4 maps, and the short cut wasn't on the sections I had printed. I improvised by taking photos of the map and navigating cross country, viewing the photos on the LCD screen on the camera. While it had its limitations it did work and I arrived at Rannoch having saved a few miles walking. I had a day off midweek and recalled the loch with the brown trout, and so I had a look at the map to see what was feasible. I checked Bruce Sandisons book Rivers and Lochs of Scotland, and could find no mention of this lochan, although nearby Lochan Sron Smeur was. North of these two lochs was Beinn Pharlagain, which looked a reasonable walk which could be completed between the early and evening trains, especially if I took the bike for the road section. 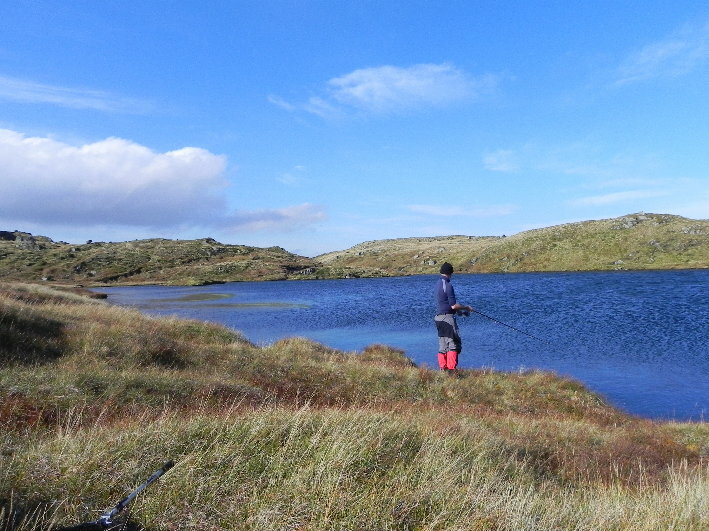 A plan had come together, I would climb Beinn Pharlagain, and carry a small fishing rod and some spinners and see if I could find out how to go about fishing Lochan Loin nan Donnlaich or the Allt Chaldar, the burn that runs south from it into the Gaur. A few casts would be all there would be time for, but it would let me know about future arrangements. The early morning train journey was surprisingly busy for the time of year, with a huge number of seats reserved. I found an unreserved seat and made myself comfortable. As the train left Upper Tyndrum towards Bridge of Orchy I could see cloud scudding along the top of the hills, demonstrating just how windy it would be up there. This was reinforced when I finally got off the train at Rannoch Station, and began pedalling, the wind making the cycle a bit more 'interesting'. There was time for a quick spot of geocaching before heading up into the hills. 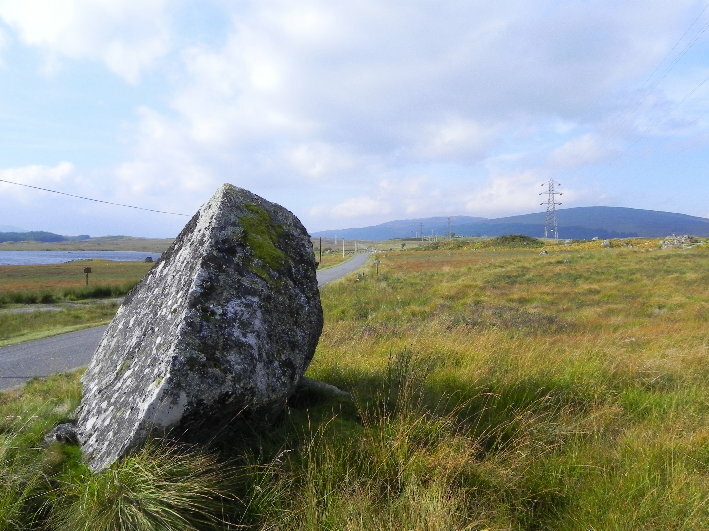 From the Geocaching website I had learned of the "Broken Heart Stone" which sits astride the road to the isles, and was broken in two when the modern road was constructed. At the last minute I had decided to switch from my folding bike to my mountain bike, and was glad I had done so. The land rover track is more than suitable for a mountain bike, even if the going is a bit sweaty! 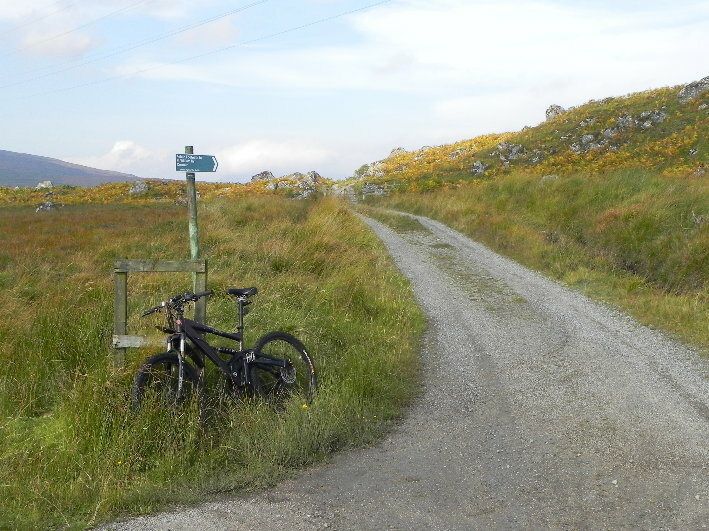 I decided that I would take the bike up as far as the bridge over the Allt Eigeach, then head up on foot. Eventually I arrived at the bridge, just after fording the Allt Gormag. There was a handy pole here, so I locked the bike to it. No matter how remote somewhere seems I will always lock the bike up, as you never know when someone while see it and decide that they prefer cycling to walking. I could see a land rover up ahead with a trailer, and at first thought that perhaps there was some work being done nearby. It was only as I headed off that it occurred to me that it was the shooting season. One of the problems with mainly walking on Sundays is that you completely forget about stalking, as it doesn't occur on a Sunday. There being no signs telling me where stalking was taking place, nor any sign of anyone nearby, I decided to continue up and do my best to avoid causing any disturbance. This was to be harder than I imagined, when a massive herd of deer rippled across the hillside, like something from the Serengeti. Jaw dropping stuff! 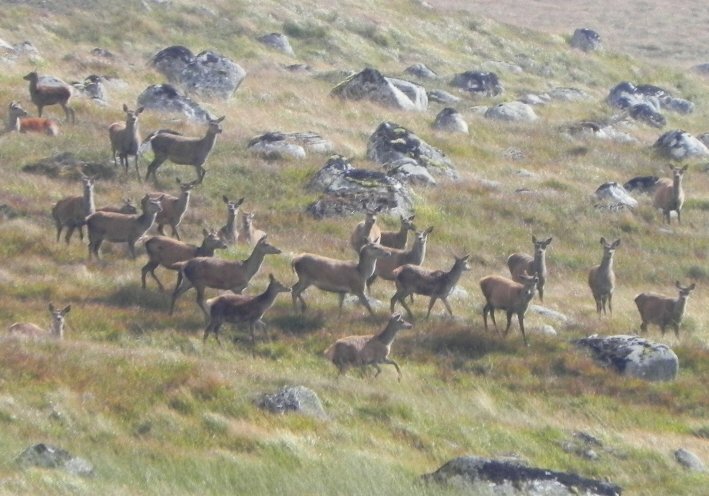 Red Deer- and plenty of them! I was finding the going tough. There was no path, the ground was steep and rocky in parts. I was carrying extra gear, not only fishing rod, lures and net, but a camera tripod. As I climbed higher the wind tugged at my hat, threatening to tear it from my head. Sweaty and frustrating is perhaps the best way to describe it without resorting to sweary words! I finally breached the initial steep slope and took a break, hoping to get some good views, but everything distant was hazy and unclear, although nearer, Lochan Sron Smeur did look amazing from here. I headed up again, the hill now a series of concave bumps. 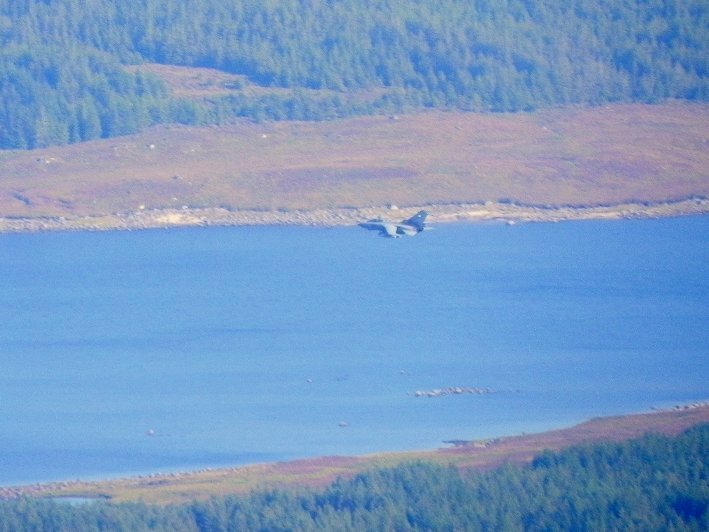 At one point I saw a party of stalkers below, so I headed round the western side of the ridge, out of sight, hopefully my scent wouldn't be a problem, the wind from the south taking off to the north. 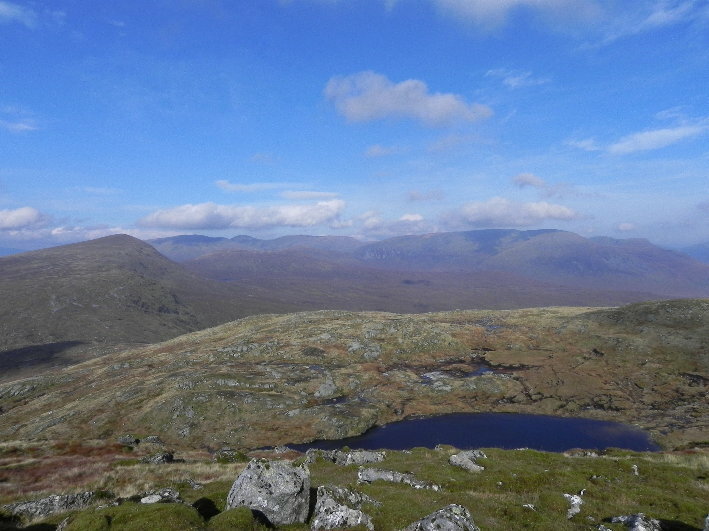 After a spot of clambering about on peat hag and bog I eventually gained the 807m summit of Beinn Pharlagain. 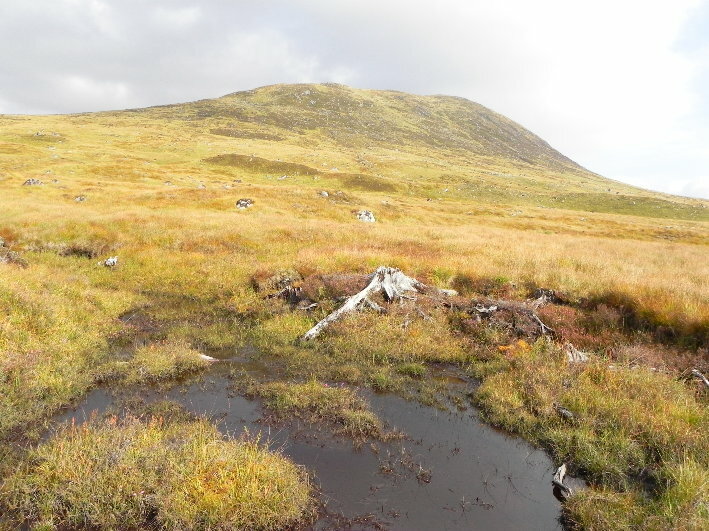 While the hill is known is Beinn Pharlagain, the actual summit is about a kilometre to the north, on Meall na Meoig, at 868m(Whey Hill). This means a drop down then across and up to the low point between the two tops, Meall na Meoig and Garbh Mheall Mor, then a final climb up to the rocky summit. I found this to be wet and boggy, and I was thankful for my gaiters. 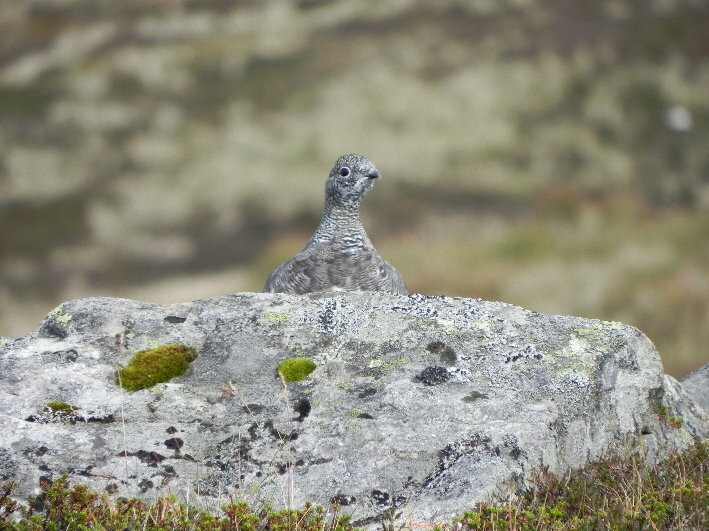 At this point things became a bit more interesting, with a number of ptarmigan playing peek-a-boo behind the rocks, and near the summit a hare doing likewise. You ain't seen me- right? 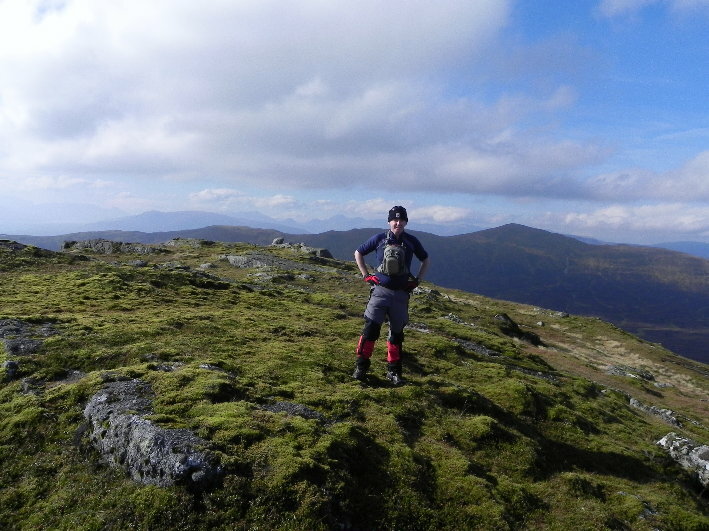 The summit is rocky with some great views to the north, where Sgor Gaibhre stands out. 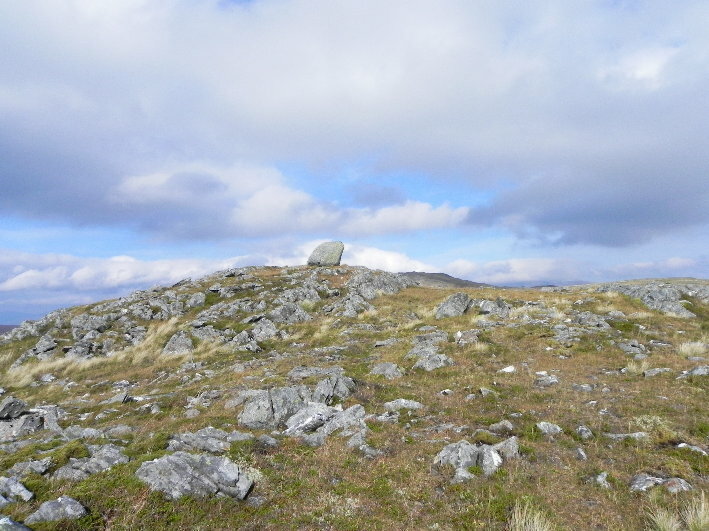 The summit has three small bumps on top, and while the cairn rested atop the southernmost bump, the GPS indicated it was the northernmost which was actually the highest. I touched them all- just in case. 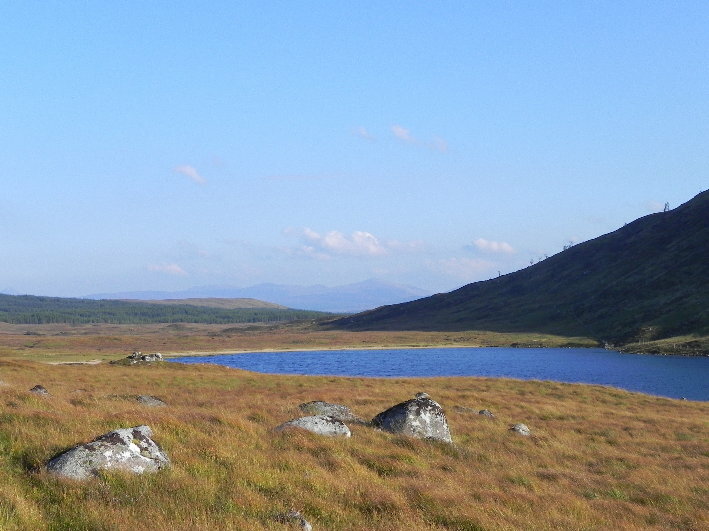 Immediately below the summit is a small lochan, an absolute gem, Lochan Meoigach. I headed down and spent the next wee while here, and I couldn't resist having a quick cast in with a spinner. With an eye on the clock there wasn't really time to stay. I had a quick bite to eat, and while sitting I noticed three stalkers appear on the other side of the lochan, heading down in the direction of Coire Dubh Garbh. I decided to head to the top of Garbh Mheall Mor, and see where they had gone. That way I could steer clear of them. On getting to the top I was granted some cracking views, Loch Ericht and down towards Ben Alder Bothy, Ben Alder itself, a hazy Schiehallion- but no stalkers. The descent down was straightforward, although I was continually scanning for deer and stalkers. 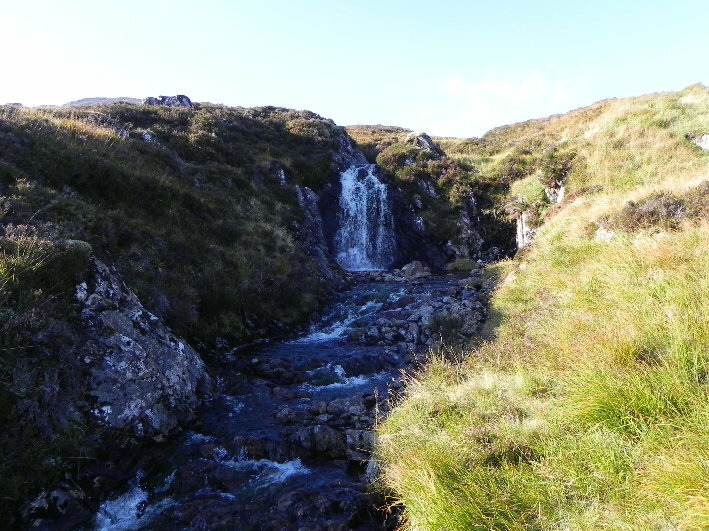 I crossed the Allt Coire nan Giomach, admiring the waterfalls as I went. 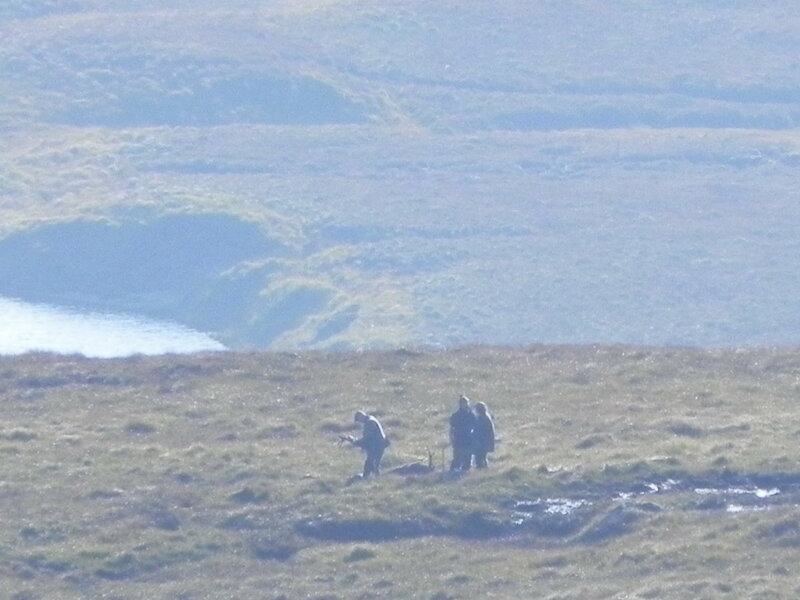 As I approached the bottom of the slope I saw off in the distance three stalkers again. How had they got that far? Once again I tried to give them a wide berth, but as I got closer down I was waved down, and one of the party broke off and came towards me. It was the stalker, who informed me that I had spoiled his shoot, and asking why I was not on the path. Apologising for spoiling the shoot I mentioned the above, that I had been on the ridge, not in the corrie, and that I had tried to minimise disturbance, which is what is recommended by the McofS amongst others. I was then told that I shouldn't be there, that I should remain on the path, and use them only, the path being the right of way to Corrour, or paths from Rannoch Station to Glencoe. Beinn Pharlagain is a Corbett and like many Corbetts, there is little sign of a path, in this case virtually none. "So that means I can't go up that hill?" said I. "That's right" came the reply. He did mention the Outdoor Access Code and the Right To Roam, but did say they didn't apply if you were causing a disturbance, which I (in his opinion) was. I also pointed out that if there had been a sign at the access point I'd have respected it (assuming it was reasonable). I was asked to drop down and take the argocat track back to the path, and was happy to comply. As I walked along I met the two clients and had a quick chat, apologising for disturbing their shoot. I had expected an earful but they were quite pleasant about the whole thing. As we walked along the deer must have realised that they were safe for a short while, coming down from the hill and crossing in front of us in a long strung out column which stretched off into the distance. They lived to fight another day. Back at the path, and the bike made short work of the way back. There was around an hour until the train, the sun was dropping and the light was giving Loch Laidon a golden hue. I got the stove out and had a curry, amazed at the light's effect on the panorama in front of me. With time ticking away it was time to get back on the bike and head back, and I made it back to Rannoch Station with a few minutes to spare. As the train headed back towards Glasgow the hills disappeared into the darkness and I stretched out on the seat. Time to put on the headphones, read my book and let the train take the strain. Get some Wolves up there!